Mequon Thiensville Temperature Drops Over 1000 Degrees! Thiensville Temperature Drops Over 1000 Degrees! On Friday, southeastern Wisconsin enjoyed summer-like weather with sunny skies and high temperatures in the 70s and 80s. On Saturday, a cold front swept in, bringing rain and plummeting temperatures, some reportedly as low as 999 degrees below zero. Readings varied widely, however – the thermometer at the TMN offices on the eastern shores of Mequon read in the low 40s for most of the afternoon. 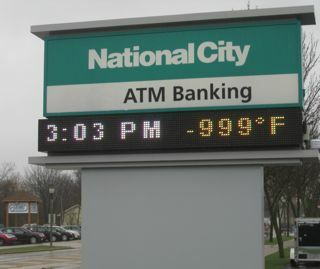 It is possible that the National City Bank branch in Thiensville, which reported this incredible, record-breaking temperature, mistakenly posted their plummeting stock price instead.